Houston residents are still picking up the pieces after Hurricane Harvey wreaked havoc on the city. The storm damaged homes and cars and left many people with nowhere to go, including 31 employees of Parkway Place, a faith-based, non-profit senior living community in Houston. 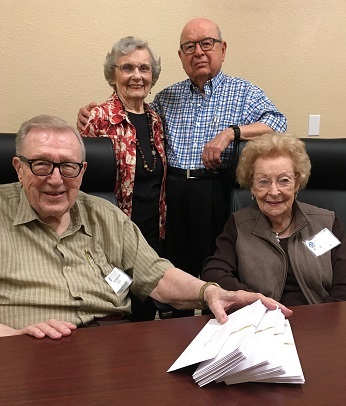 To show their appreciation for the employees, residents at the senior living community collected money, clothing and cleaning supplies to give to the team members. The residents feel strongly that this is a way to give thanks for the team’s dedication to the residents during the storm. Many stayed overnight at the community to ensure the safety of residents as well as themselves. In all, the residents raised more than $17,000, and that money was divided evenly between each of the employees. One employee affected by the storm is Duane Davis. 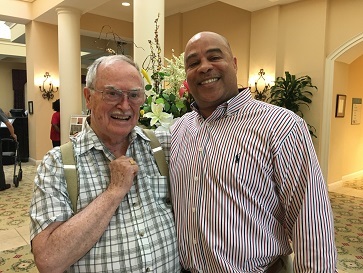 He’s been the assistant food and hospitality director at Parkway Place for three and a half years and is thankful for what the residents did. The night Harvey hit, Davis woke up with two feet of water in his home. At that point, he went into survival mode. Getting his five foster children to safety was his first concern. He was able to gather what clothes and blankets he could carry, but by the time he got all the items together the water was at three feet. When he opened his front door, the water was at his waist. He carried each child on his back to higher ground at the day care the children attend, which is about a block away. They stayed there as long as they could until the day care started to flood. Since then, the family has been living at a local hotel. Davis says his home is uninhabitable right now and their four cars were destroyed. While his emotions are all over the place, he knows God will find a way.